The little bat makes a heartbreaking squeaking cry when she sees Denise approach her, but she doesn’t realize she’s about to be in safe hands. A tiny baby bat was hanging onto life after her mom was killed. 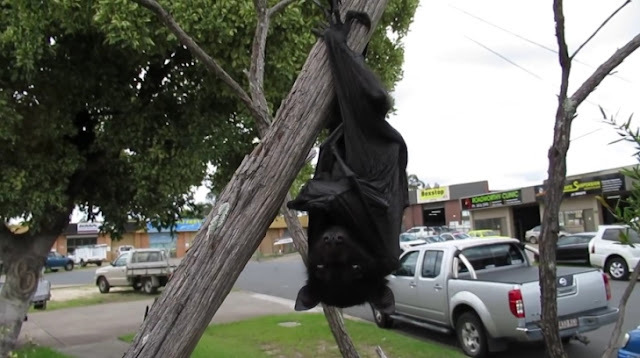 The orphaned baby flying fox was alone for a few days and was cold, thirsty and hungry when bat rescuer Denise Wade found her hanging in a tree. Denise, who rescues bats in Brisbane, Australia, said that the reason she shot the video is to help people recognize when a flying-fox needs help and says if you hear a crying sound like the one in the following video, call a wildlife rescuer for help because there’s a baby who needs urgent help! Denise brought the bat back to her home for rehabilitation and named her Miss Sapphire. At this point, things are looking better for Miss Sapphire. Here she is sucking on her bat binky and staying warm and snuggly with her foster mom, Denise. If her last toe hangs on, she can be let back into the wild! Responses to "Orphaned Baby Bat Squeaks And Cries In Fear As Rescuer Comes To Saves Her"
I am so grateful there are other humans out there trying to help our critter friends .. Thank You.